Get a modern color-blocked look with the Active by Grey's AnatomyTM Women's Tri-Color V-Neck Solid Scrub Top. This style is the perfect way to get a pop of color without wearing a print. 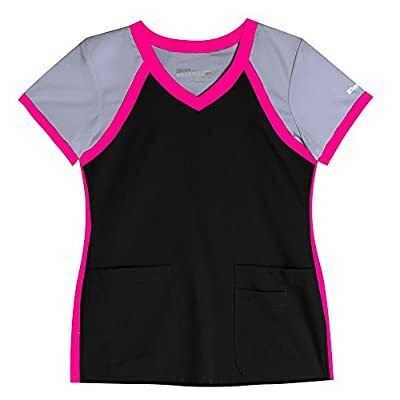 Junior modern fit Athletic styling Banded v-neckline Contrast short sleeves with banded cuffs Contrast raglan sleeve banding and sides Two front patch pockets with exterior cell phone pocket Side vents at hem Junior fit 77% polyester 23% rayon Center back length: 26"